With the arrival of the Mercury Accelsior PCI Express SSD, OWC claims to have the only Mac bootable PCIe solid state drive currently on the market. The Mercury Accelsior comes in four different size configurations, 120GB, 240GB, 480GB, and 960GB, and will set you back $360, $530, $950, or $2080, respectively. Despite its relatively high price point, the Accelsior’s performance is among the best SSDs we’ve seen, and its ability to upgrade capacity as needed is definitely a plus. On the Accelsior, you will find two “blades” (as OWC has dubbed them), each with their own SandForce SF-228X controller and 24nm Toshiba Toggle NAND. The benefit of this configuration is that it allows you to upgrade capacity as needed, whenever OWC makes upgraded “blades” available for purchase. Out of the box, this SSD is configured as RAID 0, but can also be used in RAID 1, if desired. To test this drive (we tested the 480GB version), we inserted it into an available PCI slot in a Mac Pro, and booted off an Intel 520 Series SSD, using the Accelsior as a secondary drive. To get a feel of the 520’s performance, we ran it through the AJA System Test, and it yielded an average 226.9 MBps write and 264.5 MBps read time. When comparing the Mercury Accelsior to the similarly-priced OWC Mercury Extreme Pro 6G Serial-ATA SSD ($930), the Mercury Accelsior yielded comparable file and folder write and read times for both our 10GB file and 10GB folder. 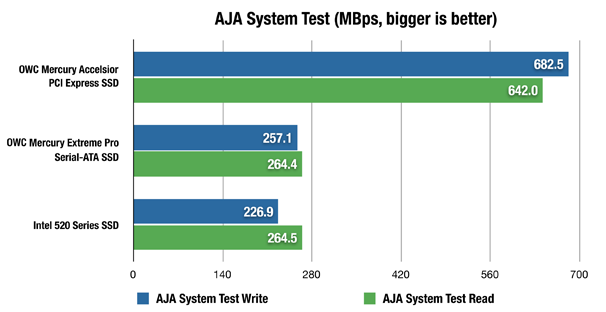 The only major difference came from the AJA System Test, in which the Extreme Pro only posted a 257.1 MBps write, and 264.4 MBps read speed, while the Accelsior recorded speeds of 682.5 MBps and 642 MBps to write/read, respectively. In it’s own right, the Mercury Extreme Pro is an impressive drive, and it tested much faster than most of the other SSDs we’ve seen. It outperformed a 256GB Crucial SSD, as well as our 520 Series Intel SSD. The Mercury Accelsior PCIe SSD is an impressive piece of hardware. The combination of different configuration options, upgradable capacity, and high-speed transfer rates make for an attractive addition to your Mac Pro. The only real drawback is the price, which is noticeably higher than all but the highest-end internal SATA-connected SSDs. Ultimately, if you are able or willing to buy the Mercury Accelsior, it will certainly boost the performance of your Mac Pro, especially when it comes to booting, and processes such as rendering audio/video files. Editor's note: Updated 7/5/12 at 2 p.m. PT to clarify the performance results of the 10GB file tests.